It was just as I suspected. I now have a companion and much to my surprise I think I am going to like her. She is younger than I and really will need someone to look after her. She was carved in Sterling, VA by a lady named Judy Brown. This lady has been carving Hitty dolls since 1983 and this one is #150. Since we both can not be called just Hitty, her name is HittyBelle. That name was chosen because the original Hitty's formal name was Mehitabel and Belle was the middle name of many of the past generations of Robertsons. She arrived dressed in a pretty calico dress and Esther put her on my bench to take her picture and then introduced her to me. She looked so timid that I really had to be nice to her. The first thing she did was admire my turquoise necklace and of course that made me happy. I'm not sure I will ever let her borrow it though. Esther explained to me before she arrived that we would be sharing many of the things but I feel my necklace was a personal gift. We spent the rest of the day telling each other about ourselves. She really didn't have much of a past, being so young and all, however, she did have some things to tell me about the place from which she came. She told me that #37 that Mr. Fifer made is going to live with Judy Brown. I told her all about the rooms that are planned for us. She thought they sounded really nice and comfortable and thinks she is going to like it here. 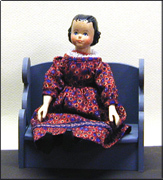 Judy Brown's Hitty is named Dallas and she watches Judy make her dolls but is disappointed that they don't get to stay very long. HittyBelle was an exception since she got to stay around through the holidays and help decorate the Christmas tree with all the other dolls that were present. She brought this picture with her to show us. Dallas is the one seated on the chair wearing red boots. I told her about how I helped write the Christmas cards and bake the cookies. It certainly looked like a lot of fun decorating a tree so maybe next year Esther will let us both help with the Robertson's tree. 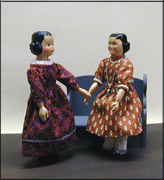 I am have had a change of heart and am enjoying having another doll for company.